With raised awareness of RM 620 safety issues in recent weeks after multiple severe accidents, we invited a number of key policy makers on the front lines of these issues to our monthly board meeting. The focus on safety also drew a sizable group of attendees from our community – enough to pack the cozy Bella Mar community center with standing room only with about 35 in attendance. The meeting allowed for a healthy dialogue between the community, special guests and board members making for a productive meeting. Thank you to all who took the time to come out to speak and listen – your efforts are much appreciated! SRNA has been working with officials and other groups including the HOA and other neighborhoods to advance our corridor needs for traffic, safety, and other issues, and we do need your help. We asked those at the meeting who are passionate about making a difference to consider getting involved. If you would like to get involved or you know someone who can help, please contact us: chair@steinerranchna.org. We meet every month in Steiner Ranch on the second Tuesday at 7pm, Town Square Community Center. 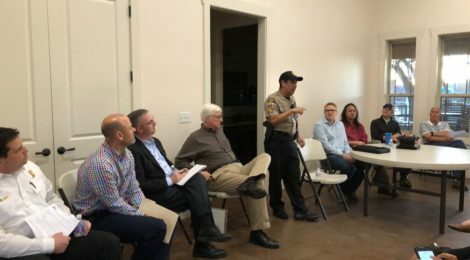 In the recent weeks before the meeting, SRNA had heard from TXDOT, Representative Paul Workman, and had been in contact with Commissioner Brigid Shea and the TCSO West Command office related to the recent traffic incidents and safety concerns. We would like to thank all of our officials for being responsive to our community’s concerns. We will continue to dialogue with all officials and relay community suggestions, concerns and sentiment. If you have concerns that are not captured in the meeting minutes and actions please contact us. We will need help in coming weeks for the big push that is needed to advance the longer term projects our area needs. Please mark your calendar for the next Monthly meeting, Tuesday, April 10. Commissioner Brigid Shea and others are tentatively on the agenda. During the meeting, we had a productive discussion around the short term measures in plan for RM620 Safety and some new ideas for incremental improvements in safety. We also discussed the big fixes that SRNA has been working and announced that April will be an important month for the community to get involved due to the CAMPO planning period. Mr. Ramthum (TxDOT) talked about the recent texturizing of RM620 that occurred immediately after some of the recent incidents between Quinlan Park Rd. and the dam. This was a precautionary measure to improve traction in the near term as a stop gap until the more advanced resurfacing is applied. Mr. Ramthum described plans to due a full re-surfacing of RM620 from the dam through RM2222 that includes a high-grip surface that sheds water into the surface instead of over it. This was already funded and planned for 2018 and needs to wait for sufficient nighttime temperature so will likely happen around May, 2018. It was asked why there is no speed limit sign from Quinlan Park Rd. going south to the dam. It was asked why there is an inconsistent speed limit depending on direction between Quinlan Park Rd. and RM620. There were a number of questions about the speed limits on RM620 and whether they could be lowered to improve safety. TXDOT described the process by which speed limits are set and indicated that there is no intention to lower the speed limits only as a result of the recent accidents. Speed limits are set based on national standards after speed studies. Many of the accidents that occur on RM620 are due to driver error including distracted drivers and drivers driving too fast for road conditions / speeding. The longer term strategy includes raised medians to separate directions of travel (see “long-er term fixes” below). For the bypass project expansion on RM620 does not presently include any high barriers despite loosing incremental width of the center lane. There is a curb planned for a subset of the updated roadway. Action: TxDOT was requested to investigate a true barrier to go with the bypass project (e.g. block accidental direction crossings) in the stretch between Steiner Ranch Blvd and the new bypass road since there are no access points along this stretch. Can we add barriers between directions of traffic for the larger curves along RM620 such as between RM2222 and Steiner Ranch Blvd. and between Quinlan Park Rd. and the dam. One specific option suggested was to add a blocking barrier that would preclude crossing traffic. A second option would be to add visual warnings to assist drivers and help distracted drivers to recognize the curves similar to the reflective raised pylons along the center lines installed on the curve at top of Tumbleweed Hill on RM2222. Action: TxDOT to investigate these options for improved cross traffic visual and/or physical separation on curves. Sgt. Rios described the enforcement paradigm for RM620 and the county. It was asked why we don’t have equal coverage to Lakeway w.r.t. enforcement north of the dam on RM620. Sgt. Rios noted that resources are relatively sparse, with on average around six officers on duty to cover the entire county at any given time for traffic. Morning (and afternoon) priorities are generally school zones and school buses and related enforcement. It was noted by Sgt. Rios that the budget for the traffic enforcement group has stayed constant over the last decade as allocated by the Commissioner’s Court. Action: follow-up with Commissioner Shea regarding enforcement funding levels and future plans to allow for increased enforcement presence. Sgt. Rios indicated that RM620 and Steiner Ranch do get relatively high coverage density compared with other areas of the county due to the topographically constrained nature of the area; i.e. once in the area for enforcement the narrow section of RM620 and the Steiner Ranch neighborhood are the only near-by areas to patrol. ESD #6 LTFR has invested in signal coordination along RM620 for emergency vehicles. This technology saves minutes of response time to events. It was asked if we have an emergency evacuation plan for Steiner Ranch. The answer is yes, see here for a link to evacuation planning and emergency egress improvements: SRNA Safety Page. Mr. Barber indicated that Rep. Workman could not attend due to a family commitment. He talked about some of the legislative initiatives that Rep. Workman has been working on including for funding of transportation as well as protection of property owners rights. Mr. Workmans’ offiice has been working with TXDOT to coordinate response to community concerns. Bruce Byron of TxDOT presented the full set of safety improvements included with the so-called “mid-term” projects identified in the TxDOT RM620 corridor plan. These improvements include a raised median to separate opposing directions of traffic from Quinlan Park Rd. to US 183 and also include an upgrade from four to six lanes of travel for improved mobility and reduced traffic back-ups. This plan is the next step for mobility and improved traffic flow after the “bypass/widening of 2222”. See here for the study page: http://www.txdot.gov/inside-txdot/projects/studies/austin/rm620/rm-620-feasibility.html [ http://ftp.dot.state.tx.us/pub/txdot/get-involved/aus/rm-620/corridor-study.pdf ]. The Lakeway portion of the plan was submitted for including in the 2018 CAMPO TIP (Transportation Improvement Plan) for ultimately build out by 2022. The improvements north of the dam are not presently included in a funding timeline. Brian Thompto of SRNA described the goal of getting the improvements north of the dam into the plan as a top goal for SRNA and our community and indicated it is up to us to get this project the political support needed to get on the CAMPO funding schedule. SRNA has been actively working with TxDOT to promote this project and to build project awareness for the last several years, but we will need to work as a community to secure funding and a timeline for these important improvements. Note that in the CAMPO 2040 plan, these improvements to RM620 were the top specified priority for roads for the Austin area. c. attendance at CAMPO meeting as appropriate. SRNA is awaiting a response from TxDOT presently on the status and outlook for the mid-term project and is expecting an update by Monday, March 26th. At that time we will roll out an outreach plan where we will need the communities help to advocate. Note: If you want to learn more about the general SRNA traffic strategy and further background related to these plans you can read here: traffic. Agenda Item 2: Traffic signaling improvements needed for RM620 @ 2222, 2222 @ River Place Blvd, 2222 @ Sitilo del Rio, etc. 2a. Need improvements for better traffic flow today (improve until bypass project). Action: SRNA already has started dialogue and will setup meeting to pull togehter TxDOT and COA to review signaling both Today and for the new improvements and seek support for application of more advanced technologies to align with the opening of the new segments. SRNA has been working with the HOA and county to address traffic flow, signage and enforcement discrete actions. Action: SRNA to setup regular dialogue with Sheriff (perhaps come to regular board meetings periodically similar to what LTFR does today) – use meetings to coordinate planning for Steiner internal learning and activity with the Sheriff. SRNA has engaged the developer to discuss acute traffic flow concerns for the property over-all and also to discuss and work through smaller opportunities like landscaping. Additionally we have requested a “buy-out” cost. Action: as we learn more we will keep the public and HOA informed.